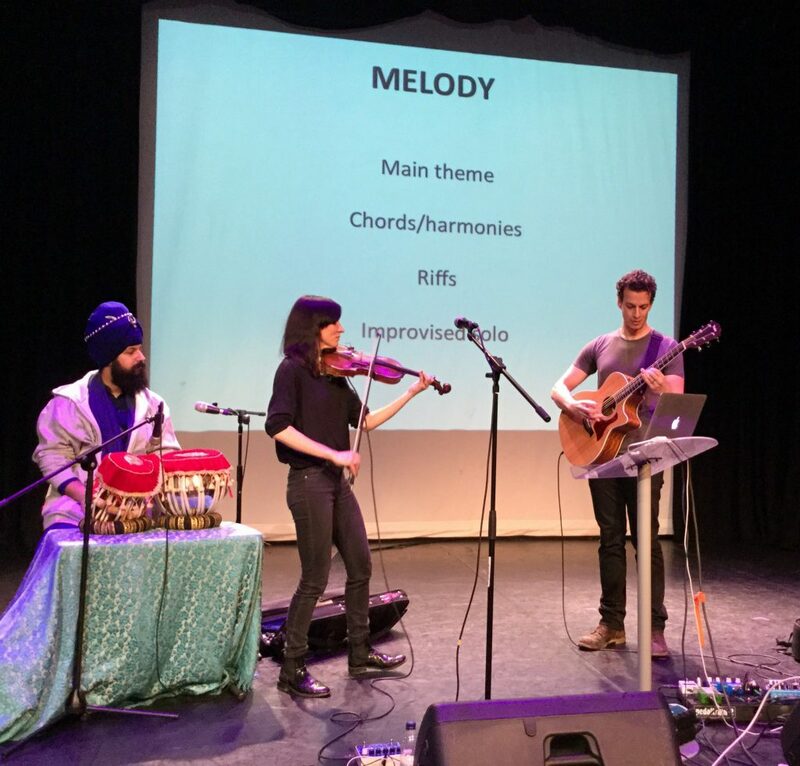 To kick off our Performance Week, the School of Music and Performing Arts were thrilled to welcome Anna Pheobe and Nicolas Rizzi, known collectively as Papillon, to Canterbury Christ Church University. Papillon are a relatively new project, despite the fact that the duo have known each other individually for many years, that combines raw, eastern-inspired violin and guitar melodies with cinematic soundscapes. Their work embraces classical music, folk, rock, new composition, film and TV work and exciting visuals and improvisation. Anna Phoebe has performed throughout the world as a featured soloist for various artists and is now carving a career with her own projects. Together with Nicolas Rizzi and her band, Anna released her EP Embrace in 2013, followed by the album Between the Shadow and the Soul in 2014. 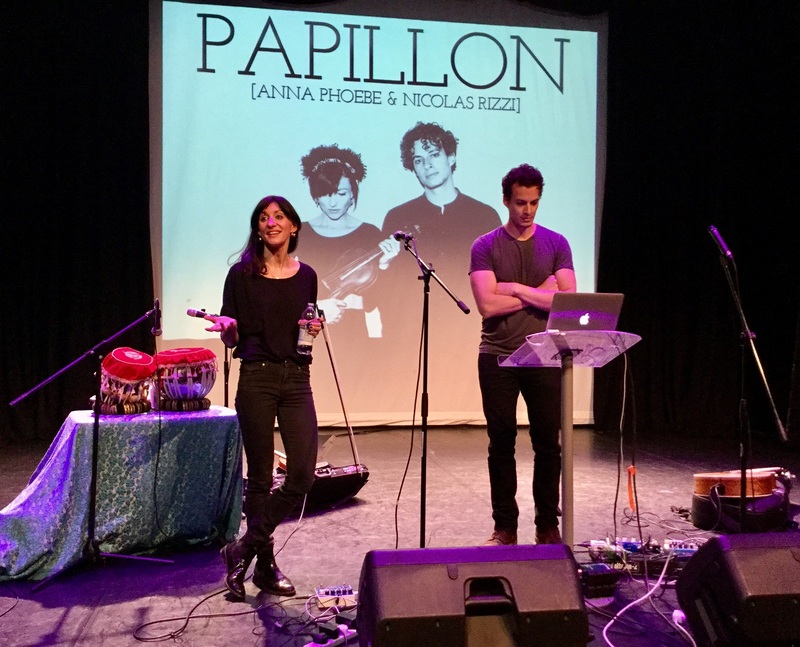 As Papillon, Anna and Nicolas are performing new material in a series of live concerts this year in preparation for the release of their debut album. Previous live performances include main support for Bob Dylan at the Rock Legends Festival in Poland, the Songlines Encounters Festival at Kings Place in London, and a tour of UK cathedrals including Winchester and Liverpool Anglican cathedrals. Anna Phoebe has played major arenas all over the United States, in London venues including the Royal Albert and Royal Festival halls, and at festivals from the Fuji Rock and Sonar Festival to Glastonbury. Anna has toured with artists and bands including Jon Lord, Jethro Tull, Roxy Music, Oi Va Voi, and the Trans-Siberian Orchestra. Anna also composes for film. She was a finalist in the Best Composer Category in the 2013 Underwire Film Festival for her original score for Harriet and the Matches, directed by Miranda Howard-Williams. Her film composition work ranges from avant-garde contemporary classical pieces to electronic soundscapes that weave vocals and strings. Anna has played violin and viola on BBC soundtracks for various composers including Peaky Blinders and the BBC series of War and Peace. In preparation for a fantastic concert in Anselm Studios on Friday evening, where the duo performed a range of tracks from their forthcoming debut album as well as some of Anna’s previous works, they first took the time in the afternoon to present a workshop for our students, appealing to all practitioners of the creative arts, with the assistance of tabla drummer and friend, Simran. Papillon have undertaken performance masterclasses such as this for schools and universities including the Royal Ballet School, focusing particularly on improvisation and creativity. The workshop was entitled The Business of Creativity and the audience settled into the session swiftly as both Anna and Nicolas appear so warm, charming and relaxed in their teaching style, yet tremendously informative at the same time. They have a natural ease about them, knowing exactly when to teach and when to pick up their instruments and demonstrate. They explored multiple subject areas in their two-hour workshop, discussing some aspects individually and others as a group from each point of view. 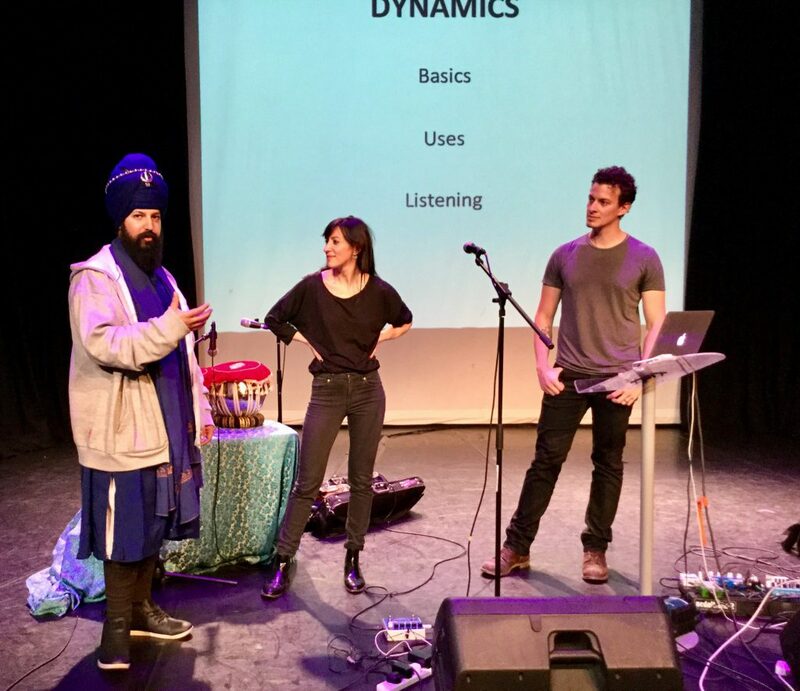 To begin, they spoke of the process when producing a piece of music and the tools they use to help to build a well-structured and expressive performance piece. The journey they take through mood, image and emotion and how all of these aspects can have an impact on how the piece evolves through practice and creativity. That transition between an initial idea, appearing perhaps through various improvisations, into a fully formed work. They also deferred to percussionist, Sim, on how much of an impact rhythm and dynamics have on the creation of these works and how to use it as a starting point or even as an addition throughout the process. He also demonstrated a popular tabla rhythm – a source in ancient tribal music and nature – known as the 16 Beat Taal, the beat of which is imagined as the steps of a horse’s hooves, from a walk through to a full canter. The three of them also indicated how melody plays an important part, whether it exists as main theme, as chords or harmonies, in riffs on the guitar or even as an improvised solo on the violin. They went on to discuss the performance itself, which they believe starts the moment they step onto stage, rather than the moment they begin to play. As such, Papillon believe that they must be mentally and physically prepared in advance, considering their aims of their performance and getting in ‘the zone’ for incoming improvisation. Equally essential, they state, is the understanding of why the audience turn up to a show and ensuring their expectations are met, by crafting and creating performance moments they will remember, which they most certainly did when performing musical snippets for our students throughout the workshop. Personal physical preparation for the duo is a mixture of good general fitness, practice, experience and analysis of previous performances, with mental preparation requiring a moment of calm or meditation before a performance, stepping into ‘the character’ they present on stage and a little bit of age-old team bonding to fire themselves up before they begin. All these things assist with the inevitable nerves and adrenaline that all performers feel – they assure some of our less confident students – no matter how skilled and experienced they may be. Finally, the duo touched on their separate experiences of working as a professional musician, the how’s and why’s of running your own business. The differences and difficulties of being self-employed. They spoke openly and with personal emphasis and examples on the necessity of finding one’s own path, the balance of taking risks, learning to be flexible, how to successfully seek collaborations and work with mentors and how to handle working and living in a competitive musical world. They closed with an enthralling full-length performance of one of their tracks with the assistance of Sim, before initiating one final interactive question and answer session and chatted genially with our students. What a pleasure and privilege it was for our students to get so close to such amazing performers. A tremendous thank you to Papillon for their time and their advice; we hope it will not be the last time they pay a visit to Canterbury Christ Church.